Ahhh, it’s been getting warmer and warmer lately, which means it’s smoothie season! They really are such an easy way to get in some much-needed fruits and veggies, that I should do them year-round. More importantly, with a newly-mobile 9 month-old who loves crawling everywhere and hates sitting still, I need a fast option for a breakfast or snack that will provide me with energy to keep up with him. Usually when I make my smoothies I just do almond milk, baby spinach or kale, berries and any other fruits that look good. I used to occasionally add protein powder, but when I was pregnant and then later nursing I skipped the protein powder because I was never quite sure that they were okay to use. I’ve experimented with various whey protein powders and even plant-based ones, but some of those just had that chalky taste to them. I think I’ve finally found a plant-based protein powder that I actually like! I was introduced to Healthy Skoop plant-based protein powder through the Stonyfield Organic Clean Plate Club. With an impressive blend of plant-based protein, probiotics, antioxidants, omega-3s, vitamins, and minerals, Healthy Skoop truly is a nutritional powerhouse, perfect for those crazy on-the-go days. When I opened the container, instead of that musty old plant smell from the plant-based protein powders, instead I got a whiff of chocolate and cinnamon, almost like cake mix! Very promising. I also liked that Healthy Skoop donates a portion of its profits to help provide fresh fruits and vegetables to school lunch programs around the country. Obviously I chose the chocolate-flavored Healthy Skoop, and though it’s pretty good on its own with some almond milk, I wanted to play around with it. 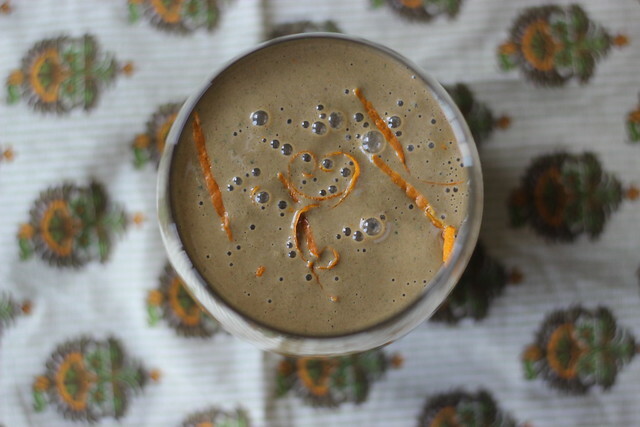 Rather than my usual greens + berries combo, I thought back to this amazing chocolate-orange milkshake I had on my birthday and decided that’d be a fun way to change up my smoothie. I found frozen mandarin orange segments and used those, but you can use fresh orange or clementine segments instead. 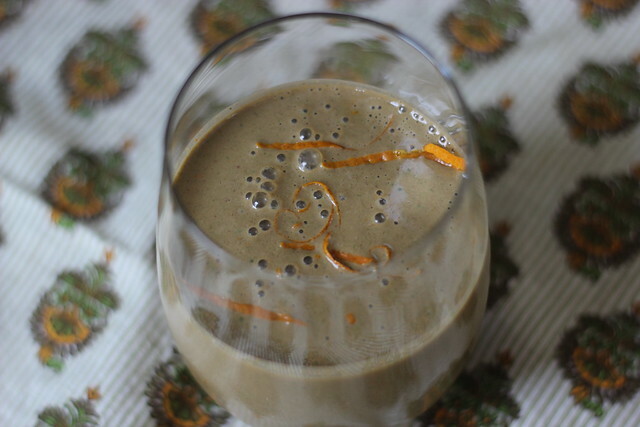 You definitely need fresh orange zest though to get that orange flavor in the smoothie. Play around with the proportions of milk to yogurt, especially if you’re using plain versions of either. *Disclosure: Stonyfield Organic provided me with coupons for their yogurt and compensated me for this post as part of their Clean Plate Club. Healthy Skoop provided me with a sample of their chocolate-flavored Super Skoop All-in-One nutritional shake as part of this month’s campaign. All opinions are my own. Combine ingredients in a blender in the order listed. Blend on smoothie setting until smooth. Add some more fresh orange zest as garnish if desired. My husband would love this, he loves orange chocolate! Chocolate-orange always a winning flavor combination!